Our research is focused on studying and computationally modeling the protein machinery that drives membrane biology. Lipid bilayer membranes are bi-molecular lipid sheets, roughly 3-6 nanometers thick, that protect and compartmentalize the cellular machinery. 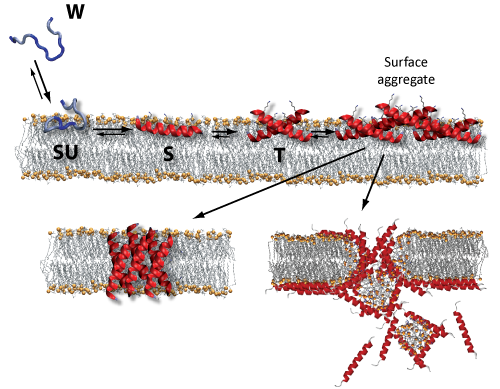 Communication and transport across lipid bilayers is achieved by proteins associated with or embedded into the bilayer. Come and join an international group of students and post-docs working at the forefront of bioscience simulation and modeling, with extensive international collaboration in China, the USA, and Europe. We collaborate with the experimental and computational lab of Martin Ulmschneider at Johns Hopkins University, Baltimore, MD, USA. SJTU students will be encouraged to travel and partly do their Ph.D. projects in the USA. Calculated I-V curves for Na+ (red) and K+ (blue) used for calculation of single-channel conductances. McCusker, E.C., Bagnéris, C., Naylor, C.E., Cole, A., D’Avanzo, N., Nichols, C.G., Wallace, B.A. MD Simulation of spontaneous insertion of the antimicrobial peptide PGLa into a DMPC lipid bilayer. Mechanism of antimicrobial peptides. 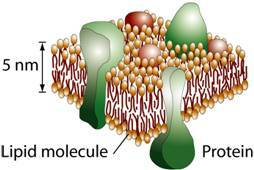 The peptides adsorb to the membrane and form surface aggregates. Subsequently, they kill the bacterium either through pore formation or membrane lysis.